On trading days, the New York Stock Exchange, or NYSE, is open Monday through Friday from 9.30 a.m. to 4.00 p.m. Eastern for the Core Trading Session. Pre-opening session begins at 7.00 a.m. ET whereby orders can be entered and are queued until the Opening Auction at 9.30 a.m. ET. The Closing Imbalance Period spans from 3.45 p.m. to 4.00 p.m. The New York Stock Exchange, or NYSE, observes all U.S. holidays and stock market holidays for 2018, 2019 and 2020 are listed below. Is the NYSE stock market open on weekends? Is the stock market open on the day after Christmas Day, Dec 26? When do NYSE partial holidays take place? Apart from fixed holidays, when is the NYSE closed? 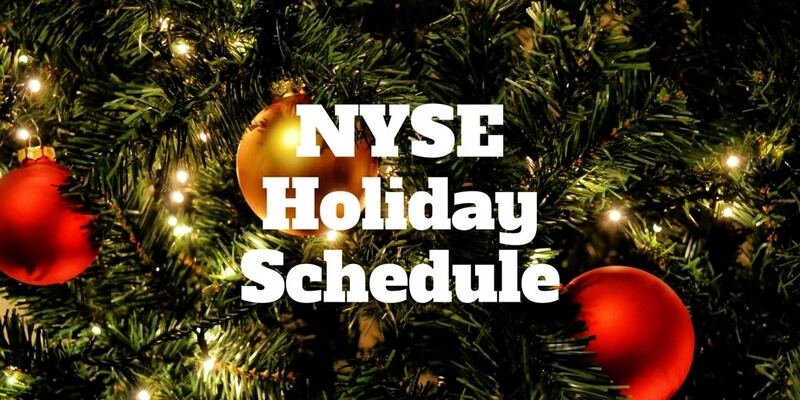 NYSE Arca Equities observe the same holiday schedule as the NYSE. However, when the NYSE closes early, the NYSE Arca Equities hours may vary as a result of its extended trading day. For eligible options, the closing time is 1.15 p.m. Eastern time zone. Friday, November 27, 2020, which is the day after Thanksgiving. For continuous executions, Crossing Session orders are accepted beginning at 1.00 p.m. until 1.30 p.m. Eastern. The NYSE bond auctions are conducted twice daily at 4.00 a.m. ET for the Opening Bond Auction and at 8.00 a.m. ET for the Core Bond Auction. If an order has not been executed during a bond auction, it becomes eligible for continuous trading immediately after the auction. Early Trading 4.00 a.m. → 8.00 a.m. Core Trading 8.00 a.m. → 5.00 p.m.
Late Trading 5.00 p.m. → 8.00 p.m. The Options Clearing Corporation expiration calendar is listed below for equity options, ETF options, ETF exceptions, index options, index exceptions, and ETN options. Equity Options 9.30 a.m. → 4.00 p.m.
ETF Options 9.30 a.m. → 4.00 p.m.
ETF Exceptions 9.30 a.m. → 4.15 p.m.
Index Options 9.30 a.m. → 4.00 p.m.
Index Exceptions 9.30 a.m. → 4.15 p.m.
ETN Options 9.30 a.m. → 4.15 p.m. The Options Clearing Corporation expiration calendar for NYSE American Options is listed below for equity options, ETF options, ETF exceptions, index options, index exceptions, and ETN options. The timelines for the NYSE American Equities pre-opening session, early trading session, core trading session, and late trading session are listed below. Orders entered will be queued until Early Open Auction at 4.00 a.m. Early Trading Session 4.00 a.m. → 9.30 a.m. Core Trading Session 9.30 a.m. → 4.00 p.m.
Late Trading Session 4.00 p.m. → 8.00 p.m. The timelines for the NYSE Arca Equities pre-opening session, early trading session, core trading session, and late trading session are listed below. Excluding holidays, the NYSE opens at 9.30 a.m. ET for trading each day from Monday through Friday. No, the New York Stock Exchange stock market is closed on weekends. No, the stock market is closed on MLK day. No, the NYSE stock exchange is closed on Christmas Day. Yes, the stock market is open on December 26. No, the stock market is closed on Thanksgiving. Yes, the stock market is open on Election Day. On Independence Day Eve and the day after Thanksgiving Day, the NYSE generally observes partial holidays by opening at 9.30 a.m. ET and closing early at 1.00 p.m. ET. During extraordinary times, such as system failures or technical glitches, wars, or even when the President of the United States dies, the NYSE may close temporarily. Did we miss any stock market holidays or NY stock exchange holidays? Let us know in the comments below. Or tell us how you plan to spend your holidays. ‹ Why Was My Credit Card Declined?